Who wins in times of business uncertainty, global economic challenges, and periods of chaos? History has demonstrated that “Operationally Excellent” companies not only survive during times of economic uncertainty, but become stronger. ffecient, more focused and more profitable. 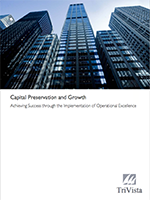 So what does it mean to be “Operationally Excellent?” At TriVista, we would subscribe that an “Operationally Excellent” company is one that balances continuous process improvements such as cycle time reduction, supply chain velocity and design for manufacturability while enhancing and building the leadership’s operational skills and value system across the organization. Far too often an organization focuses on one activity and not both.